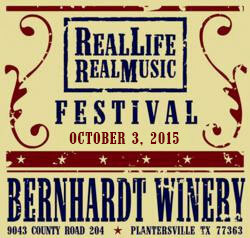 Real Life Real Music is proud to announce the line up for it’s 6th Annual Festival at Bernhardt Winery to be held October 3, 2015. Texas songwriting legend Lee Roy Parnell with hits including “On the Road”, “Tender Moments”, “What Kind of Fool”, and more will headline the amazing day of folk, country and Americana music. In addition to the sounds of acts including Kyle Hutton, The Chubby Knuckle Choir, Haley Cole, Jamie Wilson and more, attendees can browse award winning Texas art presented by The Woodlands Waterway Arts Council. And as always, Bernhardt Winery will present the finest in Texas wines throughout the day and evening. The gates at Bernhardt open at noon with music starting shortly thereafter and ending with Parnell from 8:30 – 10pm. In between main stage acts, Dosey Doe and Golds’ Gym partner to bring you the best in up and coming songwriters on the RLRM Student Songwriter Stage. In addition to music, art & wine, there will be a silent auction benefitting the RLRM songwriting scholarship program, and chuck-wagon snack and dinner offerings presented by Red Brick Tavern. Tickets to the all-ages, family friendly event are only $20 advance online, or $25 at the gate. Special VIP tickets including “rain-or-shine” stage level seating, private wine tasting with select artists, and access to VIP lounge are available for $60. The RLRM Festival is brought to you by KSTAR, Dosey Doe, Golds’ Gym, Pierce Pools, Rick Raanes of Keller Williams, Child & Family Eye Care, and Texas Fence Co.
For all information including schedule of performers and ticket purchases visit www.realliferealmusic.com. Coolers, lawn chairs, and blankets allowed. No outside alcohol.